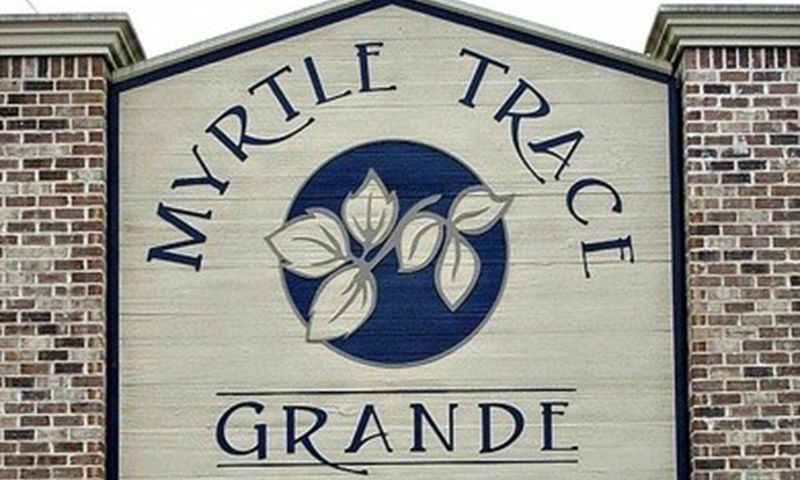 Myrtle Trace Grande is an active adult community located in Conway, South Carolina. This picturesque 55+ neighborhood contains 96 single-family homes available on a resale-only basis. Myrtle Trace Grande is home to a number of amenities to keep neighbors physically and socially active throughout retirement. Conveniently located just outside of Myrtle Beach, the Conway area gives residents the chance to explore everything Coastal South Carolina has to offer. The central hub for socialization at Myrtle Trace Grande is located in the clubhouse, where neighbors can gather to enjoy the many amenities available. Clubs and activities take place in the meeting room or residents can challenge each other to a game of spades in the card room. Outdoors, residents can find even more entertainment. Go for a relaxing dip in the outdoor pool and spa, or just meet up with neighbors on the patio. Residents can take a stroll through the community grounds or even read a book by the beautiful scenic lake for a bit of relaxation. D.R. Horton developed the 96 single-family residences of Myrtle Trace Grande between 2006 and 2010. These homes range in size from 1,232 up to 1,630 square feet and offer three bedrooms, two bathrooms, and an attached two-car garage. Homes come with low-maintenance exteriors, outdoor patios for relaxation, and nooks for extra space. Potential homebuyers have six different home styles to choose from, giving optimal options for every taste. Socializing with neighbors is of the utmost importance at Myrtle Trace Grande. Groups meet to go on bike rides or read the latest novel. Residents stay in shape with water aerobics and exercise their minds with Mah Jongg or card games. The community also holds a variety of events including block parties, garage sales, and golf outings. Additionally, a homeowners’ association (HOA) fee takes care of basic community maintenance, meaning residents have more time to truly enjoy the relaxation of retirement without the hassle. Myrtle Trace Grande is located in Conway, South Carolina, just outside of Myrtle Beach. For everyday conveniences, Myrtle Trace Grande is just down the street from Jollie’s Grocery as well as several other small shops and restaurants. Highway 501 is close for regional travel, but for farther destinations, Myrtle Beach International Airport is 13 miles away. Conway Medical Center is just a five-minute drive down the road for any and all medical needs. Myrtle Beach itself is just a 20-minute drive from Myrtle Trace Grande, making it easier than ever for residents to enjoy the beautiful beaches of the Atlantic Coast. For boating, golfing, and relaxation the area is a true dream for retirees. The community is also near the Waccamaw National Wildlife Refuge, making outdoor recreation a breeze. Thanks to the number of amenities available both in and out of the community, Myrtle Trace Grande is a highly coveted 55+ community in Conway, South Carolina. There are plenty of activities available in Myrtle Trace Grande. Here is a sample of some of the clubs, activities and classes offered here. Myrtle Trace Grande contains 96 single-family homes. These homes range in size from 1,232 up to 1,630 square feet and offer three bedrooms, two bathrooms, and an attached two-car garage. Homes come with low-maintenance exteriors, outdoor patios for relaxation, and nooks for extra space. Potential homebuyers have five different home styles to choose from, giving optimal options for every taste. Please Note: Not all floor plans are available at this time. 55places.com is not affiliated with the developer(s) or homeowners association of Myrtle Trace Grande. The information you submit is distributed to a 55places.com Partner Agent, who is a licensed real estate agent. The information regarding Myrtle Trace Grande has not been verified or approved by the developer or homeowners association. Please verify all information prior to purchasing. 55places.com is not responsible for any errors regarding the information displayed on this website.